We are beyond thrilled to announce that our first satire of the Obama administration will premiere in front of the big man himself at the 65th Annual Radio and Television Correspondents Association Dinner on June 19th in Washington, DC! While we can’t give away any of the details about the video yet, we can say that we intend to rock the socks off of the 1,500+ gathered journalists, politicians, dignitaries and other assorted power brokers. There’s no banjo in this music track, folks! Check out the ridiculously awesome all-star rock band that recorded the song. This is the second time we have had the incredible honor of entertaining a President. 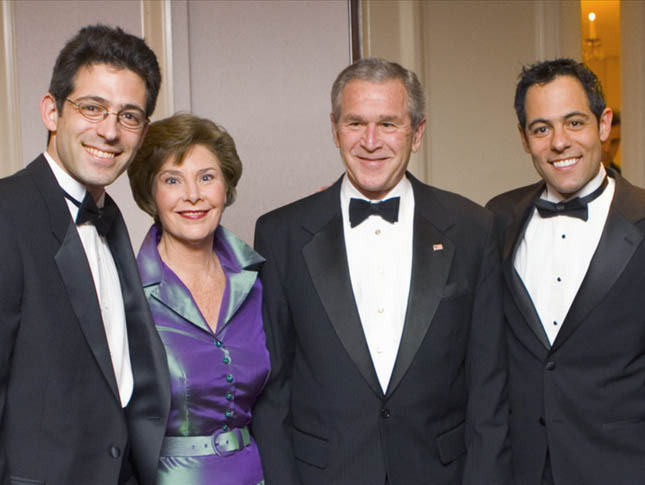 Two years ago, at the 2007 Radio and Television Correspondents Dinner, we premiered “What We Call the News” along side the company of G.W. Bush and a rapping Karl Rove. Evan and Gregg even got to meet the POTUS! Regardless of your politics, there is no higher honor we can think of as comedians than having the opportunity to be court jesters to the leader of the free world! Stay tuned. We’ll be announcing more news on our latest and greatest animated short on this blog, on our Facebook page. You can also get up to the second updates on the event by becoming a fan of the RTCA on Facebook or by following them on Twitter. This entry was written by paulhanges and posted on June 2, 2009 at 12:33 pm and filed under Obama 09, Sneak Peeks, Team JibJab with tags barack obama, Radio and Television Correspondent's Association, RTCA Dinner. Bookmark the permalink. Follow any comments here with the RSS feed for this post. Trackbacks are closed, but you can post a comment. So…. why has it taken so long to nail the Obama (or as I call him… ‘Obama Bin Laden’) White House to the wall for their Communist actions? Especially with socialized healthcare, socialized insurance (AIG anyone? ), and especially automobile manufacturers (Chrysler, or even Government Motors)??? C’mon… who really wants to drive a Prius?!?! Silly environmental wackos. Congratulations!!! jibjab rocks all the socks in the world!